The maritime community of Greenmanville was an industrial village that manufactured ships. The site of Mystic Seaport Museum was a mix of meadow and marsh along the Mystic River estuary when George, Clark, and Thomas Greenman bought the property in 1837. The three brothers had served their shipbuilding apprenticeships under their father in nearby Westerly, Rhode Island, in the 1820s. As local demand for small fishing and trading vessels increased, they joined their older brother Silas as journeymen at his shipyard near the head of the Mystic River, about two miles upstream from here. After Silas returned to Westerly in 1834 to establish a yard there, George continued to work as an itinerant builder locally while Clark and Thomas traveled to South America in 1836, aboard a vessel commanded by Captain Joseph W. Spencer, to build a river steamer for Mystic entrepreneur Silas E. Burrows. When they returned, the three brothers established their own shipyard in 1837, purchasing 12 acres of land at the bend of the Mystic River, land with enough slope to launch a vessel and with clear access to deep water. Like the majority of American shipbuilders, the Greenmans began their yard by supplying the local need for vessels. The depression following the Panic of 1837 may have limited their options, yet their output was entirely typical of the many small shipyards whose scale and volume of work was determined by their local maritime economy. In Mystic, that was fishing and coastal shipping. If it were not for their personal drive and fortunate circumstances, the Greenmans — like some of their contemporaries downriver in Noank — might have remained small local businessmen whose success would have depended on the local economy. But in the early 1840s they were able to enter a larger market. Thomas’s and Clark’s association with Captain Spencer during their expedition to South America paid off five years later when Spencer encouraged his employers, E.D. Hurlbut & Co. of New York (formerly, like Spencer, from the Connecticut River valley) to commission the Greenmans to build a large ocean trading ship. Then other New York shipping agents offered shipbuilding commissions, and in 1851 the Greenmans launched the large ship Caroline Tucker for New York merchant John A. McGaw, establishing a relationship that would last for almost 20 years. They continued to produce small fishing and coasting vessels for the local market as well. The very early screw-propelled steamboat Florida of 1844 suggests their willingness to be innovative. With the success of their shipyard in the 1840s, a small community began to grow around it. The brothers built their own homes and rental properties, and others built homes and boarding houses nearby. The community grew even larger when the brothers expanded into New England’s thriving textile industry and built a woolen mill in 1849. They also operated farms that supplied some of the meat and produce consumed in the community. As in many New England manufacturing villages established by one family, the Greenmans were both employers and community leaders. In business, the three brothers combined their skills, George was the businessman, Clark supervised the shipyard, and Thomas was actively engaged in the design of the ships and the details of their construction. 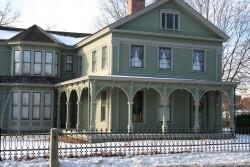 The brothers’ three houses, similar in design and standing side-by-side along the main road, suggest the unity of their mission. They also served the town of Stonington, in which Greenmanville is located, in various official positions. The Greenman brothers brought something else to their community: a specific faith and the social issues it espoused. As devout Seventh-day Baptists, who observed the Sabbath on Saturday, the Greenmans differed from their Protestant neighbors in Mystic, but they attracted a number of shipbuilding and mill-working friends and relations of the same sect, and in 1851 they opened their own Seventh Day Baptist church. In their faith they were committed to the abolition of slavery, to temperance, and to missionary work. As America neared the height of its maritime enterprise under sail, other shipyards flourished in Mystic as well. The trade in China tea had influenced the development of fast sailing ships through the 1840s, but 1850 marked the beginning of the rush to clipper ship construction in reaction to the California gold rush. Locally, Charles Mallory, a prosperous sailmaker who had become a ship owner and shipbuilder, brought clipper construction to Mystic, launching the first one at his shipyard next to the Greenman yard in 1851. The Greenmans entered the field with the David Crockett in 1853. At 215 feet long, she was the largest vessel built by the Greenmans. Like the rest of the Greenman-built clippers, she was a “medium clipper,” with a squarer hull in section than the more V-shaped hull section of the extreme clippers. By combining cargo capacity with good speed, the medium clippers extended the clipper era beyond the initial two or three years when extreme clippers could earn a profit rushing goods 13,000 miles around Cape Horn to San Francisco. With their long, sleek hulls and clouds of canvas sails, clipper ships are often considered the epitome of American naval architecture under sail, and the Greenmans built five of the approximately 400 vessels that qualify as clippers. By the late 1850s, the glut of American ships, combined with the economic Panic of 1857, changed the picture for the Greenmans. Their best New York client remained, but they turned increasingly to steamboat construction as coastal steamboat connections increased. And, as recreation spread onto the sea, they built their first yacht. Many of the Greenman ships had been used in the cotton trade, carrying America’s primary commodity, produced by slave labor in the South, to the textile mills of New England and Europe. It was one of the ironies of American history that Northern abolitionists profited from the even encouraged slavery through this maritime relationship. A second irony occurred after the Southern states seceded to form the Confederate States of America and President Abraham Lincoln mobilized the nation for a war of reunion. Although American maritime commerce was decimated by the war, and ships of the kind the Greenmans had built were dispersed to other nations, shipbuilders like the Greenmans actually prospered from the Civil War. With the government offering lucrative charter rates for steamers to carry troops and supplies south during the war, production increased dramatically. The Greenmans launched six large steamers in 1862, five in 1863, and four in 1864, some of them as much as 200 feet long. This was by far the busiest period in the Greenman shipyard. The end of the Civil War brought an immediate drop in orders for ships. With little support in Congress to subsidize the rebuilding of the U.S. fleet, the shipbuilding industry moved to where it could operate most economically. In New England this meant Maine. The Greenmans built a few more large sailing ships as well as a couple of the 15 gunboats constructed in Mystic for the Spanish government to quell a revolt in Cuba in 1869. However, as they reached their 60s the Greenman brothers became less active, even as the nation entered a decade of economic depression through the 1870s. The Greenman yard launched its last vessel in 1878, three years after the neighboring Mallory yard shut down. With the end of shipbuilding, Greenmanville focused on textile production at the Greenman mill, then called the Mystic Manufacturing Company. By 1900, with the addition of the Rossie Velvet Company, it had become a bustling mill village with a decided German and French-Canadian flavor and no evidence of the shipbuilding industry that had brought it into existence. But like shipbuilding before it, the textile industry migrated, moving south in the mid-1900s. Now, busier than ever before, Greenmanville’s new product is maritime education. 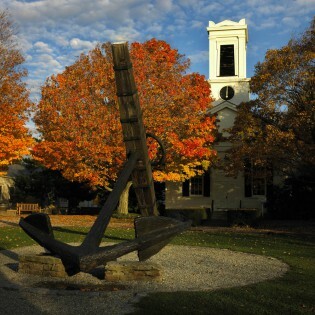 Since its establishment in 1929, Mystic Seaport Museum has grown to become the nation’s leading maritime museum. Each year, hundreds of thousands of visitors pass through Mystic Seaport Museum, learning about America’s sea heritage at the site where great ships were once built. Today, Mystic Seaport Museum owns and operates 10 original buildings that were a part of the Greenmanville community. 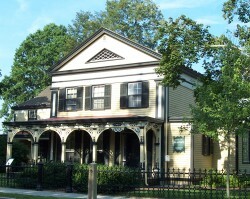 These structures include: three circa 1840s Greek-revival style houses owned and lived in by the three brothers (Thomas, Clark, and George); the Seventh Day Baptist Church (currently named the Greenmanville Church) that was built with financial support from the Greenmans; the Lewis, Brustolon, Constantine, Haynes, and Langworthy Houses (all of which served as residences for workers in the shipyard) and textile mill. Of the 10 buildings listed above, currently only the textile mill, Greenmanville Church and first floor of the Thomas Greenman House are exhibit areas open daily to Museum visitors. The Church (which seats 125) is also used for public events such as lectures, weddings, theatrical performances, and other Museum offerings. Museum visitors are also encouraged to visit the Mystic River Scale Model during their visit to Mystic Seaport Museum. The 50-foot scale model depicts the bustling shipbuilding town of Mystic in the 1870s including the Greenman Shipyard and the community of Greenmanville.